Compared to the normal chairs, the backpacking chairs are a lot lighter and compact in size. 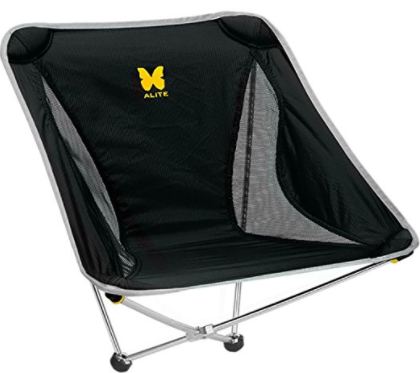 Also known as a camping chair (check out the best camping cots too!) , it is used mainly used for outdoor activities such as hiking and camping in the wilderness. Basically, the chair is foldable so it is portable for you to carry it around. When not in use, you can fold it down into a compact size and place it in your carry bag for easy transport and storage, without taking up plenty of space. With this foldable chair, you can sit back and relax under a warm fire leisurely after a tiring day of hiking or hunting for instance. In other words, it is the best thing to come back to after a tiresome day as it provides you with good back support, rather than lying down against uneven rocks or flimsy makeshift furniture. That being said, it is a must-have by outdoor enthusiasts, survivalist and campers (check out great survival food to bring along with you). It comes in handy especially if you plan to stay long hours in the jungle. Apart from that, the best backpacking chair has a strong and durable construction, hence made to last, to withstand strong winds and impacts. The factors that need to be taken into consideration when purchasing the best product is the weight, construction material, portability, comfort, weight capacity as well as presence of armrest according to your personal preference. The weight depends on the chair’s frame, legs and even armrest. Lighter products makes it a whole lot easier for you to transport it. And since you plan on backpacking, you will most probably be travelling or hiking in the wilderness for instance, for a long time. Hence, why it is important to get a light product because a heavier one will just weigh you down. The weight and size both indirectly contribute to the portability. Since it is foldable, you are able to open it and fold it down back to its compact size. Not only that, it usually comes with carry bags or cases so you can store the folded product inside the bag for safekeeping. Make sure you fold it to the smallest size so you can easily fit it in the bag. Not all chairs comes with armrests. As you know, having an armrest will just give it added weight which in return will increase the overall product weight. However, it does come in handy to ensure that you are comfortable at all times. You can rest your arms or even keep some essential items on the arm for easy access rather than making extra trips to your car to get them. 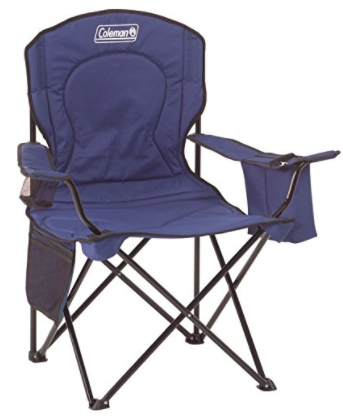 Some armrests such as the Coleman Oversized camping chair comes with a built-in cooler in the armrest so you can keep your sodas nearby, without the need to bring a separate cooler with you. Apart from that, most of them includes a mesh beverage holder so you can keep your drink in for easy access. In other words, you don’t have to hold it in your hands while relaxing. The armrest on the other hand can be adjustable in terms of height so you can adjust its angle according to your preference and comfort level. The main reason of getting a backpacking chair is to provide you with great comfort compared to sitting against rocks or the terrains in the wilderness during camping. It will provide you with good back support which especially comes in handy for campers with bad back. The seats are usually padded so you get to sit back and relax. Not only that, some of the seats include mesh parts to improve the ventilation, especially when you sit during long periods. It also prevents the pooling of the rainwater, therefore ensuring that your chair dries fast, when in contact with rain. Furthermore, most of the seat fabrics are made from polyester material that is highly comfortable to sit in. Getting in and out might be a little awkward at first, however you will get a hang of it in no time. You just need to squat a little and use the sides of the chair to lift you up. In addition to that, some chairs come with either 2, 3 or 4 legs. The ones with 2 or 3 legs requires you to balance them for maximum stability. It is important that you invest in a good backpacking chair that is built to last. There are many types of designs out there with varying additional features. You should choose the best one well-suited to your preference and needs. That being said, it all comes down to your budget, depending on how much you plan to invest on it. In my opinion, it is best to invest in a good quality one, though expensive so you can use it for a long time due its durability. Don’t let the price deceive you! The expensive ones are not necessarily the best and the reasonable ones the worst. Hence, to make the right choice, you should do a little research on the product you plan to buy either by looking through product-based reviews-like this one or customer reviews. Get the top rated ones that are comfortable, portable and easy to handle for your added convenience. This product is deemed rather sturdy and tough. Its poles are constructed from anodized DAC aluminium material to ensure that it is resistant to corrosion, when in contact with a slight drizzle when camping. The seat canvas on the other hand is made from 600D polyester material that is strong enough to handle maximum stress as well as is comfortable to sit in. Furthermore, the chair is able to support the weight capacity of 320 lb (145 kg). It opens up to a full size of 20 inch wide x 20 inch deep x 25 inch high meanwhile folds down to a compact size of 14 inch x 4 inch x 5 inch so you are able to properly store it in the included carry bag for easy transport. Make sure to fold it properly to the smallest size so fitting it in the carry bag would be simple. In terms of setup, it is rather simple and quick. That being said, it almost assembles itself using a self-locating shock cord technology. Hence, you are able to unfold and take it down conveniently with maximum ease. The chair is very multipurpose as it can be used for versatile applications such as for campfires, backpacking trips as well as outdoor concert venues. Also, it is available in a variety of vibrant colors so you can choose them according to your preference. Weighing 1.9 pounds, this product is lightweight. You can transport it easily without much burden to carry, therefore contributing to its portability. It doesn’t include an armrest, unfortunately, however look on the bright side, you won’t have added weight due to the armrest. Apart from that, it is very comfortable to sit in this chair for long hours. It sags a little low to the ground however, it doesn’t make this chair any less comfortable. Also, you can easily stand from the chair with a little push on each sides of the chair. It is equipped with a nylon mesh on the seat to ensure that it is cool and breathable at all times which comes in handy especially if you plan to sit in the chair for a long period of time. The mesh part also prevents the pooling of rainwater so it is able to dry quickly, when drenched in rain. To prevent soft ground problems, you should get an add-on kit or be creative by googling the solution so you are able to use it on beaches or slightly muddy areas. Not only that, each 4 corners of the seat are reinforced with thick padding to ensure maximum comfort on your shoulder area. This chair is available in variety of colors, however the price varies depending on the color you choose. Also, this product comes with a limited lifetime warranty, so you can get in touch with the customer service each time you face a problem with it. Apart from that, it is suitable to be taken along to almost anywhere, especially for boating and backpacking trips, as well as to parks and concerts. Unlike most of the conventional chairs, this product is a sit on the ground type of chair without poles to support it from the bottom. Therefore, you don’t have to worry about it being flimsy when on soft ground. It comes with an attached strap which secures it in a rolled form when you are not using it. In other words, it has a strap that allows you to roll it up for easy packing. Once rolled up, you are able to either tie it outside your pack or even place it inside your backpack, according to your convenience. This product is flexible as it has triangle gridded foam system. In terms of comfort on the other hand, it is very suitable for people with back problems. You can adjust the straps provided properly depending on your comfort level, to ensure you are comfortable enough to lay back and relax for long periods. That being said, with the straps, you can adjust the angle of the seatback whether you want it reclined or upright, according to your preference. However, you need to know the proper method in adjusting the straps to make easy angle adjustments. All in all, the strap adjustments are simple once you get the hang of it, from either watching tutorial videos or looking through the instruction manual. Moreover, the high density cored EVA closed cell form on the seat ensures maximum comfort as well as good insulation without any extra bulk. You can sit in damp areas with maximum comfort as it will keep your bottom dry. In other words, the seat acts as a barrier between the ground and your bottom. Weighing 1 pound, this product is lightweight and easily packable so you can carry it easily when travelling. Not only that, it is able to withstand the maximum weight capacity of 250 lb. Refrain from exerting weight above the maximum capacity to ensure that your chair remains durable in the long run. Compared to most 4 legged chairs, this product is rather unique because it stands on 2 legs only. In other word, it has 2 contact points on the ground. It is not as stable as those with 4 legs, however it still holds up well. Keeping the balance on your own doesn’t make much effort once you get used to this chair. In addition to that, it includes a bag to store in the product, once folded into a compact size. It folds down almost to the size of a water bottle so you can even store it in your purse, if not your bag. It also fits into the bag perfectly, hence contributing to its portability. The design might look a little awkward in the description picture, however it is easy to sit in conveniently. However, it takes a little practice if it’s your first time. When coming out, you need to squat a little hence, why it is not advisable for older people or campers with bad knees. Weighing 1.43 pounds, it is able to hold up a maximum weight capacity of 250 pounds. The durable and breathable fabric on the other hand cradles your body hence making it extra comfortable for you to relax in for prolonged periods. It has no fixed upright positon, so you are able to lean back and slightly rock in it, with maximum comfort. Moreover, it is equipped with a sturdy nylon construction. In terms of finish, it is available in various types of vibrant colors, which you can choose according to your preference. Not only that, it can be used for versatile applications such as camping, picnic and backyard hangouts. It can also be used on the beach, however it might sink pretty easily in the soft sand. This product is equipped with an inner mesh on the seat which comes in handy to ensure proper ventilation and breathability. It is especially important if you are sitting for long periods during a hot day. The poles on the other hand might bend a little, however don’t fret. It is quite a normal occurrence, but it is highly important to ensure that they are properly inserted all the way into the pockets before sitting down for maximum stability. From the product name itself, you’ll know that it is a large chair. It has plenty of room, you can even share it with your toddler if you plan on using them indoors or at your backyard. That being said, it is large and roomy so it is extremely suitable to accommodate larger sized users, providing them with maximum comfort. It comes with storage pockets so you are able to keep your personal belongings or additional items such as magazines and mobile phones for instance. It will save you many trips to your car as you can keep the essential items in the pocket itself. Also, it is very convenient as you get to keep your hands free and relax with this product. Equipped with a durable and made to last construction, it is made from heavy-duty steel frame that is able to support the maximum weight capacity of 300 pounds, which is 50 pounds extra than the usual products out there with weight capacity of 250 pounds. A carry bag on the other hand is included upon the purchase of this product. The carry bag ensures easy transport and storage of the foldable chair. In other words, the chair folds up to a compact shape to fit inside most car trunks or the included bag with ease. Also, this product is rather easy to setup and take down. Besides that, it weighs 7.75 pounds with an unfolded dimensions of 24 inch x 37 inch x 40.5 inch. You can either sit upright or slouch behind a little according to your preference. Also, it does not sag too low to the ground, so you can easily get in and out of it. Furthermore, the seat is fully cushioned thereby very comfortable to sit in for long hours. It provides good back support for campers with bad back and is a much better alternative than sitting against rocks or makeshift furniture. A unique feature of this chair is that it is equipped with an arm rest. The armrest on the other hand has built-in coolers that can hold up to 4 cans of sodas or so. The mesh cup holder on one side of the armrest allows you to sip on a fifth drink conveniently. In other words, you can easily access your soda with ease as well as keep your hands free while relaxing. And, you don’t have to bring your own cooler along. In addition to that, the armrests can be adjusted to different heights and angle according to your comfort level. Also, it comes with a 1 year limited warranty. The GCI outdoor camping chair is almost as similar as a tree stand in terms of appearance, and is constructed from high quality materials, therefore contributing to its excellent support construction. It is a field-tested travel chair, hence in my opinion, very well worth your investment. In terms of weight capacity, it is able to hold up 250 pounds. Frankly speaking, it might be a little uncomfortable for larger sized users due to the triangular padded seats. The seats are rather small to accommodate people with larger build. Apart from that, it is not too comfortable for sitting, especially for prolonged hours. That being said, this product is designed to offer temporary seating, not so you can lean back and relax hence it is suitable for outdoor activities such as hiking and camping where you can temporarily sit down. Also, it is rather multipurpose so you can utilize it for fishing and sports events. Weighing 3.5 pounds, this product has an open product dimension of 27 inch x 18.2 inch x12 inch as well as folds down to a size of 27 inch x 5 inch x 6 inch. It is highly portable and collapsible. Once collapsed and folded down, it will be in a compact size for easy storage and transport. It is a little heavier than expected, so long distance walking and hiking with it will be a little tedious. A carry bag is not included with the purchase of this product, therefore you should buy one separately which will come in handy to transport your foldable chair. So, once it is folded down in a compact size, it can be stored into the carry bag for safekeeping. Moreover, this product is made from powder-coated steel as well as 600 denier polyester fabric hence contributing to its durability in the long run. It is equipped with the patented Auto-Fold technology which comes with a shoulder strap for simple and quick opening, closing and carrying, for your added convenience. The padded backrest and seat on the other hand makes it very comfortable, which comes in handy for people with bad backs. Hence, you are able to sit comfortably in it for long hours. Not only that, this product is a 3 legged chair hence why, you should choose your seating position according to your comfort level. In addition to that, it includes an extra wide 18 inch backrest as well as a beverage holder. The beverage holder consists of a mesh pocket at the side, so you can easily store and access your soda for instance while relaxing, with your hands free. First things first, this product is deemed very durable and made to last. You will experience no pull, tears or splits in the long run. Its seams are very well-stitched meanwhile the stitching of the fabric is very heavy-duty and secure. Furthermore, this chair is constructed a high quality, 600D strong polyester fabric that is built to last in the long run. The fabric is comfortable against your skin and strong enough to support the heavy weights exerted onto it. Also, its powder-coated steel frame provides great stability and strength with a compact foldable design to ensure its stability. Weighing 12.5 pounds, this product is a little heavy. Therefore, it is not quite suitable for backpacking while travelling outdoors such as hiking or camping because it will be a little tedious for you. Nevertheless, if you’re transporting it with your car to your destination, it will be totally fine. From the name ‘king kong’ itself, it is obvious that this chair is large-sized overall. It comes with a wide seat with plenty of room, hence suitable to accommodate users with extremely large build. That being said, it is able to support the weight capacity of 800 pounds which is so much more offered than the average products. A shoulder carry bag on the other hand is included so you can place your folded chair into it for easy transport and storage. It is rather simple to unfold and fold it back quickly without any hassle, for your added convenience. Moreover, its height from the ground is about 17 inches once unfolded. Apart from that, it might cause a little discomfort on the back of your legs because of the extra reinforcements on the corner area of the seat, getting in the way. There is a mesh pocket at the back which is perfect for storing additional and essential items. You are able to store your magazines or drinks for instance in the mesh pocket. It will save you many trips from getting it from your car as it is easily accessible from the back itself, for your added convenience. The armrests on the other hand are easily adjustable, according to your preference. It comes with a cup holder and side pockets on each arm so you are able to store many items. The combination of the mesh pocket at the back and side pockets make it extremely convenient for you to access any important items. The cup holder allows you to be hand-free while sipping your drink occasionally and relaxing. Weighing 10 pounds, this product has a unique design as it is circular in shape, rather than the conventional regular folding chair. It comes with a storage bag that has a shoulder strap for simple carry and convenient transport. Furthermore, its padded seat provides all-around seat coverage to ensure extra comfort. That being said, it has an extremely comfortable design so you can lay back and relax. However, the chair is a little low to the ground. The package size, once it is folded measures 35 inch x 8 inch x 8 inch meanwhile its unfolded size measures 33 inch x 28 inch x 16 inch. It is available in various colors such as black, green and red in which you can choose according to your preference. In terms of construction, it is made from heavy-duty polyester fabric together with a foldable frame, to ensure maximum stability so you can sit down, without any worries of falling down. Apart from that, its sturdy steel frame construction ensures that it is durable and able to resist impacts such as strong winds. It is able to support a maximum weight capacity of 260 pounds. Also, it has plenty of room so you can even get cozy with a blanket for added comfort. Its large pocket at the back comes in handy as you can store additional items such as magazines or personal belongings for both indoor and outdoor use. Not only that, you can request for an upgraded version of this chair that has cup holders, with a slightly higher price of course. To ensure its durability, you need take properly maintain it. These maintenance steps include inspecting the screw to find for loose ones. If there are any, tighten them for smooth working operation of your chair. Store it properly at all times, do not leave it under the rain as it might get rusty. In addition to that, wipe it once in a while, to clean it. Adhere to this steps and you’re good to go. Moreover, it is rather simple to fold it into a compact size as you just need to utilize the handles on the back of the seat and it will fold up in a matter of seconds. That being said, it is easy and quick to open, close and fit in the storage bag provided. In a nutshell, it is important to get your own backpacking chair when engaged in any outdoor activities, especially for a long period of time. This is because it comes in handy to provide you with good back support and comfort, rather than leaning against rocks or makeshift furniture. There are many types of design on the market, so you should choose the right one well-suited to your preference. Hence, I hope this review assists you in making the decision. Happy camping and don’t forget pair your chair with a handy pocket knife!